Every time I come in I ALWAYS receive fast and friendly service. I also like how they are so accommodating! Chris Sanders took great care of my soon to be growing family. Was straight forward, no hassle kind of guy. He made the entire process surprisingly peaceful and stress free. My wife and I will definitely be looking to Chris fot our next purchase and you should too! Thanks again Westside Hyuandai. Micah Williams was AWESOME! He made this by far the best car buying experience!!!!! Westside Hyundai is highly recommend!! Keep up the good work. Kelton Powell we're very helpful to me I am very satisfied with his help. Every one was very helpful in helping me purchase my first vehicle. Great price and fast and friendly service. Will return for my next vehicle and will recommend to friends and family. Thank you to everyone that assisted in my purchase. I am extremely satisfied with my vehicle and the staff at Westside Hyundai! Thank you again! This is the second time I have purchased a vehicle from Westside Hyundai. Both times the employees from the Sales Manager to the Service Center Personnel were great to work with. Chris was very knowledgeable, patient and understanding to what our needs were regarding this purchase for my Sons Graduation present. He went above and beyond to help us with our choices of Vehicle we had on our list. 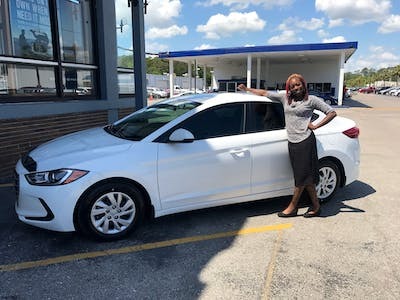 My sales representative Nicholas was awesome he really took the time to ensure that all of my needs were met and that I left with a brand new vehicle. Nick helped me pick out the right car for what I needed and was very knowledgable and helpful. Everyone at the dealership was very friendly and made buying my first car on my own a great experience. I get my oil changed here all the time. The service is great!! I wouldn't go anywhere else!! 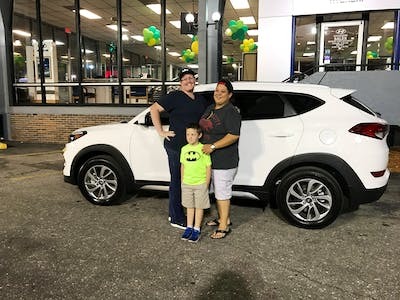 I loved my experience there it was my first time getting a new car and they made me feel like there was no way I was going to leave without it I love shopping there it was my pleasure. Friendly employees. I told them out the gate that there were 3 vehicles that I wanted to drive before making a decision and they were the 1st place I stopped. They let me test drive and gave me info on trade and let me go without pressuring me. I came back and bought a SUV. 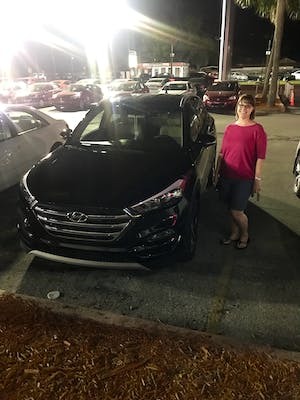 I was with my friend when she bought a car from Westside Hyundai and it did not take me long to go back and purchase one for myself. Hsienchi did a great job with helping me. I now have a brand new veloster! Love my car! This place is highly professional and caring! The waiting area is always clean and well air conditioned, the staff are kind and aware that your time is valuable and keep you informed of your waiting time. I will definitely come back to this locationn everytime! 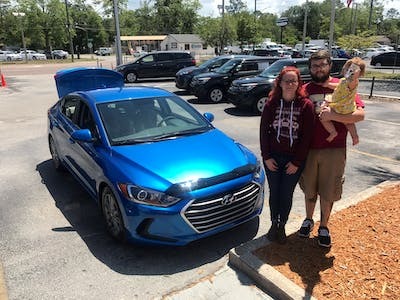 Thank you Westside Hyundai Of Jacksonville. When you have been served the best you can only give a excellent rating. Superior Customer service and they made my husband and I feel like we were VIP consumers. I want to give acknowledgement to Mr. Charles #1 salesman and now friend. His expertise is the field is top notch. Also to the General Manager, and Finance gentleman. They all made our automobile purchasing trip phenomenal. Thank you. You find yourself asking, "Where is there a new Hyundai dealer near me in Jacksonville, FL, that also offers pre-owned vehicles?" The answer is Westside Hyundai - also serving Orange Park, Fruit Cove, Ponte Vedra Beach and Middleburg FL. With a fully stocked inventory of more than 250 new Hyundai models, as well as a collection of pre-owned vehicles, the hardest part of the purchase process for buyers is picking out their favorite model. Once it's time for the fine print and paperwork, our team of Finance Center professionals is on-hand seven days per week to help you navigate the jargon, payment plans, and big decisions it takes to call yourself a vehicle owner. Our dealership is also home to our Service Center, where you can rely on our staff of factory-trained technicians to complete your Hyundai's regular maintenance, as well as perform larger repairs when needed. When you buy from Westside Hyundai, you'll feel the effects of focused, premier service, from our first greeting to you, until you return to buy your next vehicle. For drivers interested in the lineup of new Hyundai models, Westside Hyundai has a fully stocked inventory with every color, style, and accessorial combination they could want. Our collection of sedans includes the Hyundai Accent, Hyundai Azera, Hyundai Elantra, and Hyundai Sonata, each unique in their design, yet uniform in their universal appeal and functionality. The Hyundai Santa Fe, Hyundai Santa Fe Sport, and Hyundai Tucson SUVs are also available for drivers who need extra space for their passengers and cargo, while the Hyundai Accent Hatchback, Hyundai Elantra Hatchback, and Hyundai Veloster Hatchback offer the best of compact looks and surprising capacity. We also offer our lineup of environmentally conscious and hybrid Hyundai models, including the Hyundai Sonata Hybrid Sedan, and the Hyundai Sonata Plug-In Hybrid Sedan, for those drivers who want to do a little more to preserve their surroundings. Our regular selection of incentives and New Vehicle Specials is also available to alleviate costs and offer discounted pricing to our prospective buyers. Certified Pre-Owned vehicles are ideal considerations for customers who are attracted to newer cars but aren't ready or willing to commit to new vehicle prices. Certified vehicles typically boast low mileage, are newer, and have completed a series of rigorous standards testing that ensures they meet certain safety, performance, and manufacturer criteria. Given their used status, certified vehicles also carry the advantage of lowered pricing, making them the product of combined value and vehicle standards. With the assistance of our Finance Department, you can create a manageable payment plan for a reliable used vehicle that steers away from surprises. When all you need is a reliable used vehicle, turn to Westside Hyundai, where our diverse selection of pre-owned cars is stocked with Hyundai models and other models manufactured by familiar and reliable vehicle brands. From our virtual showroom, you can narrow your search by vehicle make and model, year, and mileage for a truly customized search. With our special Bargain Inventory of vehicles priced at less than $20,000, and a regular mix of available specials and incentives, we make it easy to drive off behind the wheel of your pre-owned vehicle, with a payment plan that works for your budget. We know that you're not likely to pay full price for your vehicle. Aside from choosing the car itself, the planning and execution of your payment methods is the most crucial step in the car buying process, which is why our team of Finance Center professionals are available seven days per week to assist you. Along with guidance on leasing vs. financing and the creation of your payment schedule, they are work with all tiers of credit to procure auto financing and lease terms with the lowest possible interest rates, thanks to their longstanding relationships with local and national lenders. Begin your auto buying experience today by filling out our virtual Finance Application, or call 888-475-4167 to schedule an appointment with one of our Finance Center representatives. For impeccable Hyundai service, repairs, and Genuine Hyundai parts in Jacksonville, FL visit the Westside Hyundai Service Department today. Maintaining your Hyundai with regular service visits is key in preserving its longevity and getting the best value for your investment. Our technicians know the ins and outs specific to each Hyundai model so that they can offer optimal service and the recommendations that are most beneficial to your specific model. From our in-person and online inventory, customers can select from a generous selection of Genuine Hyundai parts and accessories, which we'll happily install for you. For at-home repairs and tinkering, our system of online ordering offers a convenient and efficient way to have your vehicle enhancements and parts delivered right to your door. At Westside Hyundai, we're committed to not only helping you find your vehicle match, but to developing a relationship with our customers through honest vehicle financing and continued attention from our Service Department. 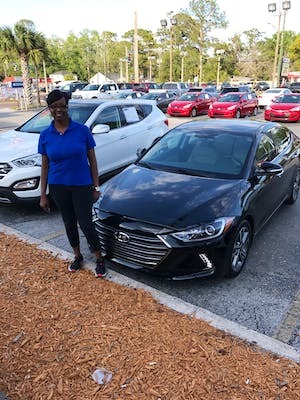 To begin your experience with Westside Hyundai, by visiting our location at 1672 Cassat Ave in Jacksonville, FL, or by calling our Sales line at 888-475-4167 to schedule a test drive.